You will not believe how easy and how good these chocolate pumpkin brownies are to make. With only three ingredients and one bowl, this easy brownie recipe is ready for the oven in no time at all. 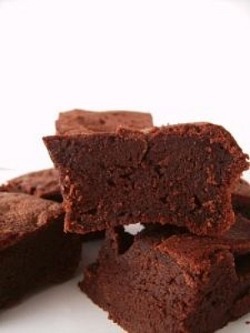 Canned pumpkin is used instead of oil or butter in these eggless brownies. Let the kids help make dessert with this easy cake mix brownies recipe. 1. Preheat oven to 350 degrees F. Grease or spray a 13 x 9-inch baking pan with nonstick cooking spray. 2. In a large bowl, combine cake mix and pumpkin until blended. Batter will be very thick. Stir in chocolate chips. Spread batter evenly into prepared pan. 3. Bake for 20 to 25 minutes or until toothpick inserted into center comes out clean. Cool in pan on wire rack. Cut into squares.